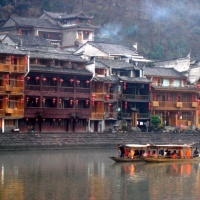 Fenghuang Old Town claims to be one of the two most beautiful towns in China. It offers beautiful sights of unique buildindings and clear river; Wulingyuan is noted for its primitive forests, which are home to huge, strange sand stone peaks that rise right from the level ground. Now, get ready for some jaw-dropping panoramic views on our hiking adventures. 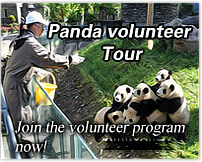 Meet your guide at the airport, and then transfer to the hotel in Zhangjiajie City. After breakfast, drive to Furong Town (aka Hibiscus Town) and then enjoy rafting on its beautiful Mengdong River. 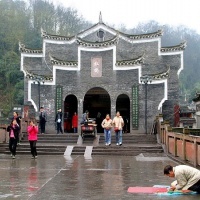 Explore the history, culture and customs of Tujia people in the town and the Xizhou Tujia Folk Customs Museum prior to drive to your hotel in Fenghuang Town. 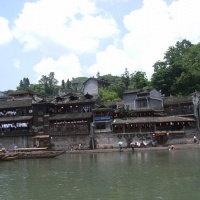 In the morning, enjoy sightseeing in Fenghuang Old Town. After lunch, drive to Wulingyuan National Forest Park and check into Pipaxi Hotel. After breakfast, prepare some food, water and fruits for lunch, then walk (about 15 minutes) to the entrance of Yaozizhai. From the starting point (in Laomuwang), we will walk 2.3 km to the top of the mountain, take a big loop around the mountain for 2 hours. In the afternoon, go to the other side of the mountain for attractions in eagle's Beak Peak and the natural arch (about 2 hours exploration), then double back. Stay overnight in Pipaxi Hotel. After breakfast, prepare some food, water and fruits for lunch, then walk along the beautiful Golden Whip Stream for 1.5 hours to a snack house, walk across the bridge, take a quiet trail along the Shadaogou Valley, it will take us 3 hours to get to the top of Yuanjiajie to enjoy the awesome beautiful scenery. Later take a park bus to see the natural wonder - Tianxiadiyiqiao (The No. 1 Bridge on Earth). Stay overnight in a comfortable hostel. Morning take the park bus to Yangjiajie, where you will enjoy a full day exploration of Wulongzhai, Tianbofu, Balipo, Yibudengtian (one step to the heaven), Kongzhongzoulang (corridor in the sky). Stay overnight in Wulongzhai Hostel. After breakfast, take a park bus to Tianzishan Mountain Nature Reserve, where you will climb up to the top of the Tianzishan mountain to visit Shentangwan, Helong Park and Yubifeng. After that, take a trail downward the mountain from the Tianzi pagoda, we will go through some beautiful attractions, such as Yueliangya (Moon Cliff), Wolongling (Lying Dragong Ridge), Shilihualang(10-li gallery) and finally reach a mini train station, where we will take the park bus to Wulingyuan entrance and then drive to the hotel. Free in the morning. After lunch, drive to the down town of Zhangjiajie to visit the Sand Stone Painting Museum. Later transfer to the airport for the flight to your next destination. Hotel Accomodation-the hotel accommodation is based on two persons sharing one twin room with private facilities.